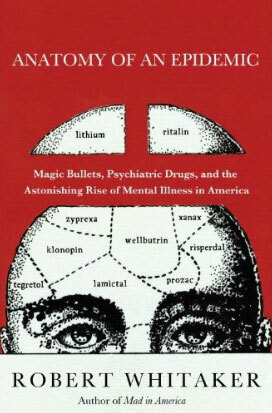 A mid-reading response to Robert Whitaker’s Anatomy of an Epidemic: Magic Bullets, Psychiatric Drugs, and the Astonishing Rise of Mental Illness in America is posted here. This is Part 1 of a two-part post-reading response to a book that has been stirring up quite a storm of conversation within mental health circles. This pair of responses is the result of a conversation between ∃ and Meredith, wherein we each summarized our take-away impressions from the book. The consensus (if you can form a consensus between two people) is that it is an often difficult, often startling, and often frustrating read. The research and reporting raise several interesting and compelling ideas while also raising several important questions, left either unaddressed or unanswered. As a contribution to general knowledge reading on psychiatry in America, it is informative but should not be read in isolation. Part 2 of this response is here. An overall comment–disagreeing with large portions of Whitaker’s argument is not equivalent to endorsing all of modern psychiatric practice! Yes, we over-prescribe, we have minimized the importance of side effects, we have been bought out by pharma–all this is now so widely known that even many of the former pharma KOLs are willing to admit it. My main problem with his book is that I think he overstates his case and paints all psych meds with the same broad brush of toxicity. The Requirements of Secondary Research. The truth is that most of Anatomy of an Epidemic is a pretend literature review. I say “pretend” for two reasons: First, it’s a dig in response to the fact that, on page 284, Whitaker puts the word “real” in quotation marks when he writes that psychiatry was “telling the public that mental disorders were ‘real’ diseases.” Secondly, and far more importantly, reporting on previous studies in an actual lit review would require reporting on the significance of statistical results and reporting on those results in a consistent manner. Instead, while he does address the flaws in many studies’ research designs, he fails to report on some incredibly descriptive aspects of scientific research, whether qualitative or quantitative. He doesn’t explain to his reader why a 10% difference in outcomes in one study is important and in others it is not. He switches from talking about raw numbers of patients to percentages of patients in the middle of discussing a single study, again without explaining why. For many studies, I don’t know how large or small the sample size was. I don’t always know how the sample was chosen, why that method was used, or the inherent biases (because all sample selection includes bias) of the method. These things are important to understanding his points of discussion, because I’m not the kind of reader who will just take his word for it. Because it is not meant to be a scholarly literature review, I don’t expect scholarly discussion. That being said, I don’t think a summary table at the end of the volume with pertinent information (sample size, statistical outcomes including significance levels, and the like) would have been too much to ask. Personally, I consider this both sloppy and suspect. The Requirements of Qualitative Interviews. Certainly, the narratives that come out of Whitaker’s collection of first-person accounts are startling, compelling, and sometimes horrific. The personal stories he reports from his interviews are a valuable component of the book. That being said, again, I am not sure how he found or selected his interviewees, but I am sure exactly why theirs are the stories told. If I remember correctly, nowhere does he address the fact that the stories are not generalizable, but are instead deeply personal glimpses. Nor does he address that he has no way of knowing whether they are typical. Further, I can’t know whether other forms of treatment were a part of these stories because he either didn’t ask or isn’t telling me. Important questions about dosage and talk therapies are omitted. In my experience, many mental illness patients employ a strategic multipronged approach to their treatment. What we know from most interviews is that these people were put on medication. We don’t know how much, if they were taking any illegal drugs or alcohol while taking meds, if the meds were switched by different doctors, if they maintained good relationships with their primary care givers, or even if they saw psychiatrists or general practitioners. We don’t know if additional treatment options were included. Personally, I consider this both sloppy and suspect. The Acknowledgement of Further or Additional Research. This is not a comprehensive look at treatment of mental illness. This may be one history of psychiatry. (Important side note: There is no such thing as THE history of anything.) While every research question has a defined scope — questions outside of which cannot feasibly be answered — it is incredibly important that the unaddressed pertinent issues be acknowledged. It is important for a reader to understand what is not being addressed in order to accurately judge the conclusions drawn. There are several lingering questions in addition to those things described above, but one in particular I’d like to highlight: cultural and societal effects on increased numbers of first episodes. I understand that diagnostic criteria have been expanded to cast a wider net and create a larger market. I also understand that a single paragraph (on page 187) with a single unexplained citation (of Putnam’s amazing Bowling Alone) is insufficient to describe the serious mental health effects of increased alienation, social disassociation, a disappearing middle class, geographically fragmenting families and fractured support systems, increased violence…honestly I can sit here and list things all day. In the middle of that paragraph, he devotes a total of one sentence to the undeniable effect of increased drug use in this country. One sentence: seventeen words in a book over 300 pages long. While he uses a sledgehammer to get his point across regarding what might happen after a first episode, he gives one short paragraph to a very real contribution to the increasing number of first episodes. Personally, I consider this both sloppy and suspect. I am the first to give credit where credit is due. This book is not supposed to be scholarly, but it wants for a greater level of responsibility in its reporting. As I wrote earlier, it is extremely compelling. Its argument is truly hammered home. The book is certainly a contribution to popular writing on the topic, but (again) it is not comprehensive and should not be read as such. Because it does not acknowledge fully what is not addressed, the work sadly has unintended consequences and interpretations, addressed in Part 2.